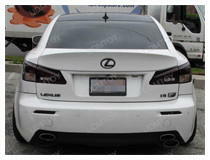 LED Bumper Reflectors were first introduced in 2010 at Tokyo Auto Salon. They were designed to replace the OEM bulb-less plastic reflectors on the bottom of the rear bumper with the same type of assembly but have the LED lights built inside. These stylish LED reflector lights provide a quick response and more light when you step on the brakes which allows other drivers to see and react quicker to avoid collision. This YouTube video shows you how to remove the bumper reflectors. Some bumper reflectors can be popped off, but in most cases, you will need to need to gain access from the back of the bumper in order to pop the reflector off since it is held with a clip or screw. So in order to do a clean job, we highly recommend you remove the rear bumper to install this product. 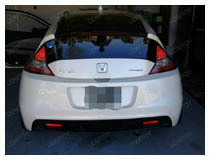 In this video, we will show you how these LED bumper reflectors function, based on a 2011 Mugen style Honda CR-Z. During the day when the headlight is off, these LED reflectors will only light up as brighter mode when you step on the brake. 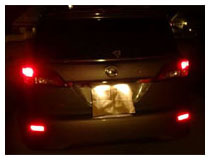 During night time when the headlight on, these LED bumper reflectors will light up in dimmer mode as tail lights and when you step on the brake, it will become brighter than brake lights. LED bumper reflector lights add an additional source of lighting on the back of your vehicle to increase visibility and alertness for surrounding drivers. Majority of vehicles are built with only a reflector piece, which is basically just a reflective plastic shell with no lighting inside. You would have to rely on the reflection of street lights, which is not dependable at all! Here at iJDMTOY, we have a variety of LED bumper reflector lights for various vehicles so that you can easily convert your bulb-less stock reflectors into LED for a brighter and safer look. LED lighting has become the top choice among car owners due to their longevity, reliability, and unbeatable brightness. Many of the newer cars come equipped with OEM LED lighting for parts of the vehicle, but there are still parts of a vehicle that need to have factory LED, such as the rear reflectors. Fortunately, you can find brilliant red LED bumper reflector lights for Lexus, Subaru, Honda, Kia, Mazda, Toyota, and much more to transform your entire lower bumper to LED lighting. All of our LED rear reflector lights are the brightest brilliant red to catch the attention of drivers behind you so they can keep an eye out and be alert. We even carry some options that have a brighter LED brake light function and some with LED turn signal features as well. These various features transition flawlessly with the touch of the brake or the flip of the turn signals. At iJDMTOY, we provide you with the most comprehensive collection of LED and HID lighting for you vehicle so that you can be fully equipped with the best possible lighting features for your ride. Our lighting specialists are more than happy to advise you on which LED lighting parts are the most appropriate for your vehicle so you can have an entire LED upgrade.